Anyhow, par-3 4th playing at 150 or so, line up my 5i on a low tee and laced one straight, but just left and nice and high . 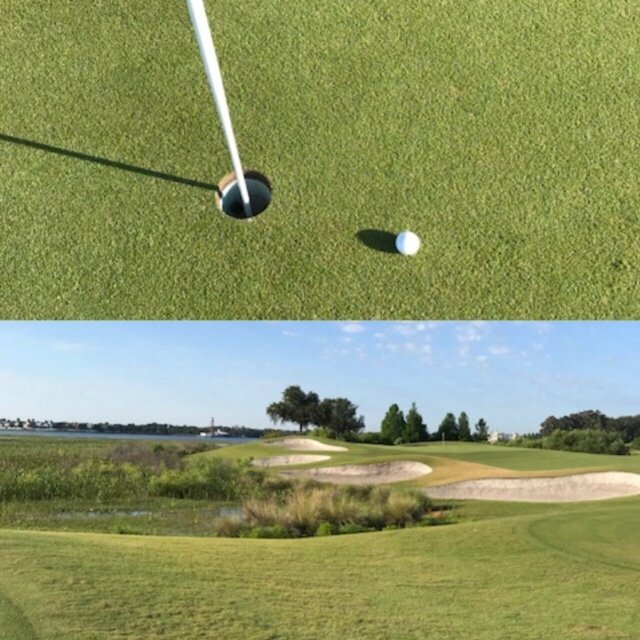 Then at the par-5 7th after hitting a long, blind downhill drive with the wind into the group ahead... , I hammered my 4i at the green where it landed a little short and right, but rolled up and around past the pin to about 20' or so for an eagle try. Again missed the eagle putt but put in in for a solid bird. First hole easy par 5. Blocked the drive right, hit trees, but bounced out. Blocked a 5 iron to the right, behind a wall of trees, in the bark/dirt. With no viable option from 106 yds, I just punched a sand wedge at the green and prayed. Second was a 180yd 6 iron on the #1 hdcp hole to 6 feet. I hooked my drive right and it bounced around off of a tree. Luckily ended up in the right rough with a shot to the green. 205 yards out, hit a low draw that actually hit and held the green. Two putts for par. Finally learning how to scramble and save a score. ... Chipped it onto the green with a good trajectory onto my spot, watched it bounce and roll out towards the cup .. and tap the flag stick EXACTLY as a gust came in from the left .. pushing the ball out of the cup..!! Oh well.. literally "the rub of the green"! 1. Ball landed in a divot. I jokingly asked my partner to turn his back so I could move it. So he rolled it out for me. I said no, I always like to hit these hard shots - it's an opportunity to make a great shot. So I put it back in the divot and pulled off a really good shot. I didn't stuff it, but I did hit it to about 15 feet from that lie. 2. Uphill par 5, decent drive, but my 2nd shot was a peach. 260yd 5wood to 20 feet. Even if I missed my eagle putt! Last Monday, Par 3, 9i, 127 yards. Yes made the bird. Today's shot of the day was a 165yd 7iron into the wind that left me with a 15ft putt for birdie on a par 5. Felt nice to visualize the low draw through the wind and execute. 223 ya drive then 8 iron to within 4 feet of hole making putt for bird! Par 5, 213 to middle of the green, hit a 3 wood landed approx pin high rolled out to 30 feet past the hole. 3 wood practice is paying off. Unfortunately I 3 putted (again). Par 3 116 yards in between a A and P wedge. First shot with the A put it into the water. 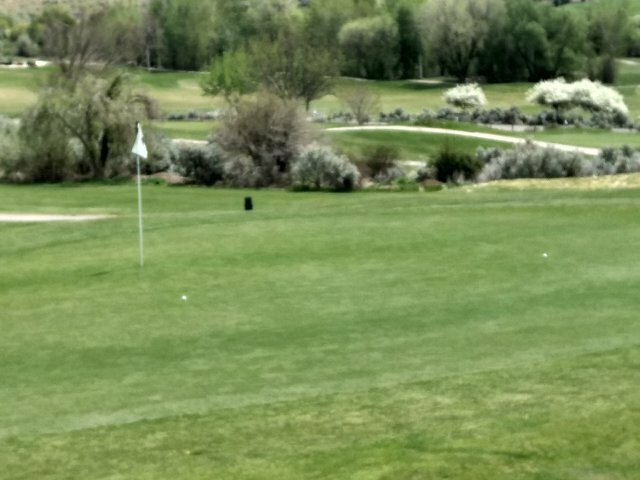 Hit the P and took some off landed it on a dime 3 feet from the hole and one putted it in for a nice little bogey. Sometimes gotta take a little off instead of trying to add a little. I hit what I would call my first succesful cut shot tonight. A 156 yard 6iron around a tree and over the water. Ended up short and landed on the front fringe. Couldve hit a 5 I suppose but short is bette then long on this hole. NormallyI would have hit 7i or even 8 depending on wind and pin. Back to back birds, and the 4 next holes I came within an inch of birds. 60 yard pitch to 3 foot on my 3rd after putting my tee shot in the water hazard on a 440 yard par 4. Made the putt for a good par. 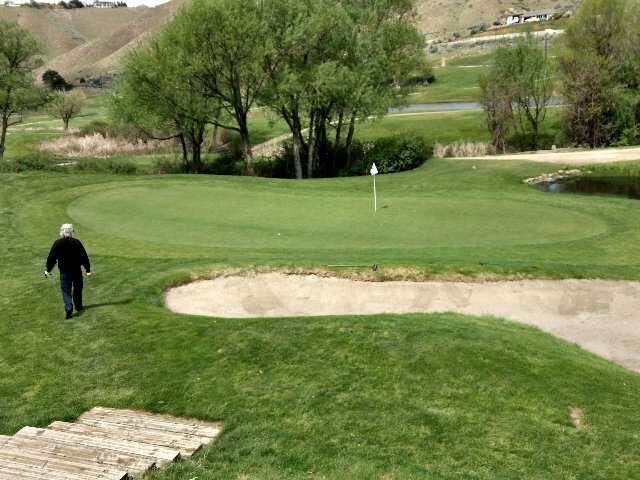 Not my shot but Web Simpsons eagle out of the bunker - holed it from 99 feet. I bought a three iron the other day and used it for the first time today. Hit it once and it was a 280 yard rocket right down the gut. Outdrove my buddy who hit driver. Played the perfect hole yesterday- 360yd par 4.
one bounce, hit flag, dropped 8 feet away, drained putt.